Solar power. Say those two words, and most people start to envision dollar signs circling above their heads. Sure, solar would be awesome, they think, but who the heck can afford it? Yes, solar is expensive. But in many cases, it actually makes smart financial sense to put in a solar system. In this second article in my Solar Power Series, I’ll be going over how to size a solar power system. This will relate directly to the third article in the series, which will cover costs and tax breaks. If you missed the first article in this series, “Solar Power 101”, you can find it here. Now, let’s start by finding out how to size a solar system so we know how much it’s going to cost. 1. How Much Free Power Do You Want? This is your first question, and it’s also going to tie in closely with the other two. For instance, you may want your solar power system to supply 100% of your energy needs, but if you live in Northern Michigan (where the sun is weak and fleeting during the long winter months), then this isn’t going to be an option. 2. How Much Energy Does Your Home Use Daily? Do you know how much energy your home uses on a daily basis? Most people don’t. But knowing how many kilowatt hours (kWh) you use is vital to knowing how big a system you’ll need. To figure this out, pull out all your electric bills from the past 12 months. Your bill might give you a daily average on the back. For instance, during the winter months my home’s daily average is 11 kWh, mostly thanks to the furnace kicking on. During the summer, it’s much lower (because we don’t use air conditioning). In July and August, our daily average is 4.3 kWh. This means my peak use is around 308 kWh per month, and my lowest use is 120 kWh per month. So, my monthly average (adding up all 12 months’ worth) is 262 kWh. The Energy Information Administration estimates that the average American family uses 936 kWh per month. You can also figure out your home’s energy use with an whole house energy monitor, like The Energy Detective from ChooseRenewables.com. A whole-house monitor hooks into your home’s meter and will give you an accurate reading of how much energy your home is using every day. These meters are cool because you get information in real-time. So if you open the fridge door or turn on the kitchen light, you see exactly how much it’s costing you. Obviously the less energy your home uses, the smaller solar power system you’re going to need to support it. So it definitely pays to start trimming down your home’s energy use. Switch to CFL bulbs, and consider getting a smaller, Energy Star rated fridge. Refrigerators are the appliance that use the most energy, and Energy Star models use , on average, 40% less energy than regular brands. Everyone knows that the sun in places like Florida and Arizona is much stronger and hotter than the sun in places like Michigan. The reason is because Florida is physically closer to the sun, thanks to the curvature of the Earth. What does this matter? Well, it means that Floridians are going to get more juice from their solar systems than Michiganians, simply because the sun is closer (and it’s out more; Michigan has a ton of clouds). So, a 1,000 square foot home in Florida will need a smaller system than a 1,000 square foot home in Michigan. The sun’s energy literally has to travel a further distance through the Earth’s atmosphere the further you get from the equator, which means it’s more scattered and weak (source: U.S. Department of Energy). So the more slanted the sun is from your location, the less usable energy you’re going to get. The sun strikes the Earth at dozens of different angles during the day. When it first comes up in the morning, it’s hitting the Earth at 0 degrees, which is just over the horizon. This is a very weak angle. When it’s at its peak, it’s hitting the Earth at 90 degrees. When it’s here, we’re getting the full force. Now, the sun’s intensity is called insolation. Insolation is measured by sun hours. So, one hour of 100%, full force sunshine is one sun hour. When sizing a solar power system, you need to know how many sun hours your area gets on average. You can find a great table about sun hours here. This chart lists the top 50 major U.S. cities, and the number of sun hours they get, on average. For instance, Phoenix, AZ gets 6.58 sun hours per day. East Lansing, MI (my closest big city) gets 4. I know this may be getting to be a bit much, but stay with me here! 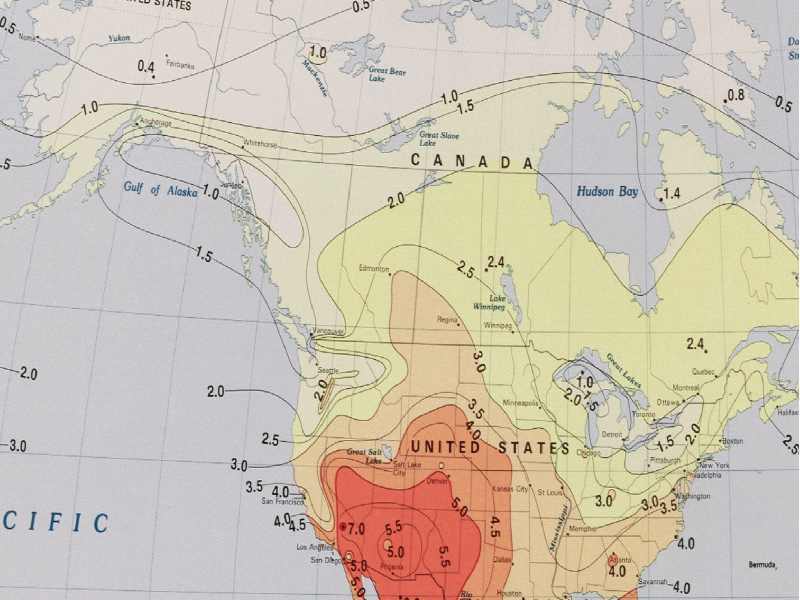 It’s helpful to see a sun map, which is a map of how powerful the sun’s rays are, on average, for different parts of the country. I got this one from Advanced Energy Group. Is your head swimming yet? I know it’s a lot to think about, but it’s vital to consider all these factors before buying a system. So, how do we bring all this information to make an accurate estimate on how big a system we’ll need? Thankfully, people much smarter than me have figured this one out for us. Researchers at the National Renewable Energy Laboratory have developed a solar calculator. Yep, you read that right; it’s a calculator that helps non-professionals figure out how well a grid-connected solar power system would perform in their area. 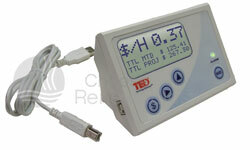 The calculator is called PV Watts, and you can access directions for launching it here. It’s actually pretty cool once you figure out how to use it. Once you enter your specifications, your location, and what kind of system you’re considering, you’ll get a month-by-month breakdown of how much energy that system will produce for you. If you’d like a slightly easier solar calculator, then head over to Find-Solar.org. Their calculator is very simple to use. All you enter here is your zip code, and how many kW you use per month (or how much your average electric bill is). Anyway, this calculator is super easy to use, so don’t miss it. 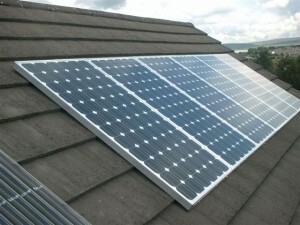 If you’d like to do this the old-fashioned way then here is an informative formula I got from ResidentialSolarPanels.org. To do this you need to know a) how much energy your home uses daily and b) how many sun hours your home gets per day on average. Let’s say that all of those things average out to 600 watts on average. Over the course of 24 hours, you need 600 watts * 24 hours = 14,400 watt-hours per day. From our calculations and assumptions above, we know that a solar panel can generate 70 milliwatts per square inch * 5 hours = 350 milliwatt hours per day. Therefore you need about 41,000 square inches of solar panel for the house. That’s a solar panel that measures about 285 square feet (about 26 square meters). Yeah, so I know this turned into a doozy of an article, but there is definitely a lot to consider when sizing out a system. My next article in the series, Solar Power System Costs and Tax Breaks, is going to cover how much you can expect to spend on a system, and the tax breaks you can get by installing one. Again if you missed the first article in this series, “Solar Power 101”, then click here to check it out. Solar Power is all the rage, but is it right for your home. IS THERE A WEB SITE WHERE YOU CAN PUT IN A ZIP CODE AND GET THE SUN HOURS PER DAY ???? Home Power Magazine is my favorite magazine, and they are top-notch when it comes to learning about renewable energy. If you scroll to the bottom of that page, you’ll see a link that will take you to a .gov site where you can look at individual state sun hours. That’s about as close as I could find! I’m sure there are some out there, but I couldn’t find them with a search on Google. If you have more time, you might just want to google “sun hours” and start wading through the sites. If you can calculate your home’s energy needs with a calculator, then I’m sure there has to be a sun hours calculator out there somewhere. Good luck, and please let me know if you end up finding one! I’m sure other readers would find that incredibly useful as well. Brilliant source of information. Thankyou. A very detailed article and interesting to see the entire flow of information laid out. The only thing I can add is that I have noticed many people relying solely on online solar energy estimators. Although they could provide you with a ball park, sometimes they could be misleading. So although online does give you a decent picture, its good to also speak to your local installer. For example, the online programs don’t acount for when you need to have parts of your roof replaced before the system is installed, or if you need trees cut down which are blocking sunlight, and finally you may be able to work out financing or leasing options. Be wary of diy projects unless you are comfortable with going on roofs and plan to get no incentives from the government. The government will only approve UL listed panels. In some, dont look for short cuts and spend the time with your local installer as well as online. If you are upset about the affordability of these systems, give it some time and as the research and development continues to pour in, we will all be able to afford sustainable energy systems. For providing timely information and a place to share ideas, especially concerning solar energy. I work on small projects in the Los Angeles area and enjoy hearing about projects going on nationwide. I am especially interested in the idea of a solar powered container house. If there are any projects in The L.A. area I would be interested in knowing more. Chicago and its outskirts are pretty wind friendly especially for smaller horizontal axis technology. The winters are brutal though. Wow! so much good info! thanks!